Contemporary photos show that a wooden marker to Elisha Mitchell stood roughly five feet high and was cut in shape of a grave marker. It was painted white with black lettering. The marker stands at the head of the cairn which marks Mitchell’s grave and is held in place by the stones that make up the cairn. Bottom: MCRARY AND SON / ASHEVILLE, N.C. The earliest mention of the temporary marker is September 1922. The 1888 12 ft. tall memorial to Mitchell had been destroyed by strong winds in 1915 leaving his grave marked only by a stone cairn. The site was acquired by the State of North Carolina in 1915 and a wooden observation tower constructed in 1916. Stones from the cairn had been removed to form the observation tower base. This, combined with previous acts of vandalism by tourists, created an uproar and in 1917 former Governor Julian Carr was chosen to lead a committee to erect an appropriate memorial. Carr’s plan which called for a monument that copied the Washington Monument was never carried out. The temporary marker was replaced by a bronze plaque in 1928. Mitchell, a professor at UNC had fallen to his death near a waterfall that now also bears his name. The UNC professor was in Yancey County to measure the altitude of the mountain then known as Black Dome. Prior to his death Mitchell had come under attack from a former student at UNC and then Congressman Thomas Lanier Clingman for his claim that Black Dome was the tallest peak in the eastern United States. Clingman had claimed that another mountain in the Black Mountain range was taller. The dispute involved who had first identified what is now known as Mt. Mitchell. Clingman claimed that Mitchell had identified another mountain that was later named Clingman’s Dome. Mitchell’s claim to have identified the tallest mountain was later bore out. 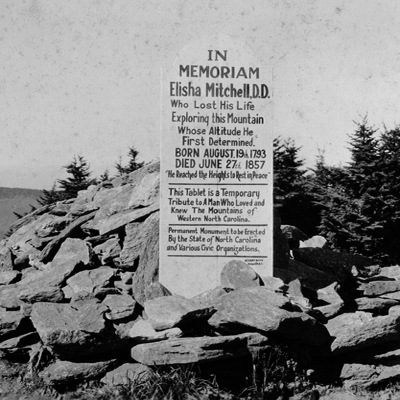 Originally buried in Asheville, Mitchell’s body was re-interred at the top of Mount Mitchell in June 1858. The burial site was marked by a simple cairn until 1888.